I have an awful sweet tooth. To the point that I can’t really keep sweets in the house or I’ll eat them all. You can imagine what a problem the temptation at the bakery was. I’ll admit that sometimes I didn’t make something just because I knew I wouldn’t be able to keep myself from eating it. Mid morning scone? Sure! Cookie with lunch? Why not! I think biking to work was the only thing that kept me from weighing 5,000 pounds. Now, life is a little different, more sedentary. But I still get those sugar cravings, especially in the middle of the afternoon. I try to keep bars around to help quench that craving. They’re usually only slightly better than eating a cookie, but I kid myself that they’re much healthier. A couple of months back, I was contacted to see if I’d like to try Eat Nakd Wholefoods bars by a company out of the UK called Natural Balance Foods. After checking to make sure they were vegan, I said sure, I’ll try them. And when I looked up these Nakd snack bars, I found them not only to be vegan, but unprocessed. They have no added sugar and are sweetened with dates and occasionally other fruit. They are dairy, wheat and gluten-free. The bars are also mostly raw and do use some non-GMO ingredients, but they aren’t 100% fair trade or organic due to sourcing issues. And they’re definitely suitable to those on a wheat free diet plan. The pecan pie bar somehow took those three simple ingredients and gave them that kind of caramel-like flavor that an actual pie has. Dates are kind of magical sometimes. The Nakd snack bars are a little smaller than some other bars, but it was enough to put off the craving. So, I’m not sure I’ve ever had rhubarb anything. And if I have, it was likely mixed with strawberries. So the flavor of this bar was unfamiliar to me. I didn’t hate it or think it was gross, but I wouldn’t choose it. But you might like it if you’re into rhubarb. I’m a fan of cashews and love using them to make cheesecakes and cheesy sauces. So of course I liked the cashew cookie bar. Bars are convenient to carry to the coffee shop where I work sometimes. Especially when I’m trying to avoid the vegan zucchini bread and cookies they carry. And they have a long shelf life so they can hang out in my backpack until I need them. My favorite of the flavors were the chocolate varieties. No one will be surprised by this. The texture reminds me of fudge or a softer Tootsie Roll. And the crunch varieties have little soy crispies in them. I think I actually prefer the crunch to the smooth, but I’m not that picky. I’ll go for either especially if they’re chocolate. You can get Nakd snack bars on Amazon.com but it looks like it’s a better deal from their site. The site offers free shipping and they’re running a special on the combo pack. So if you’re looking for a new bar to try with clean ingredients, you should give these a shot. 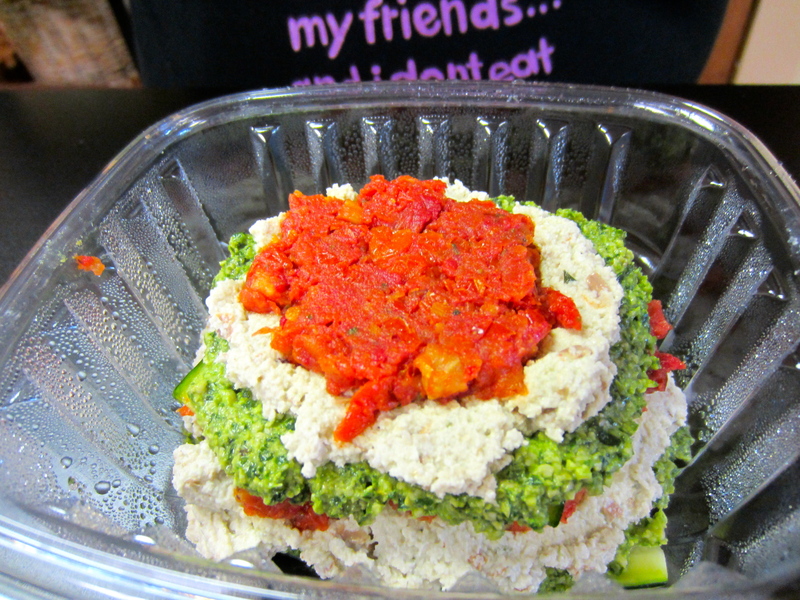 If Healthful Essence was more convenient, we’d definitely eat there more often. It’s kind of like a healthier version of Soul Vegetarian. Here’s what we got last trip. Kevin had the raw lasagna. It was good but could have used some fresh basil and maybe garlic. 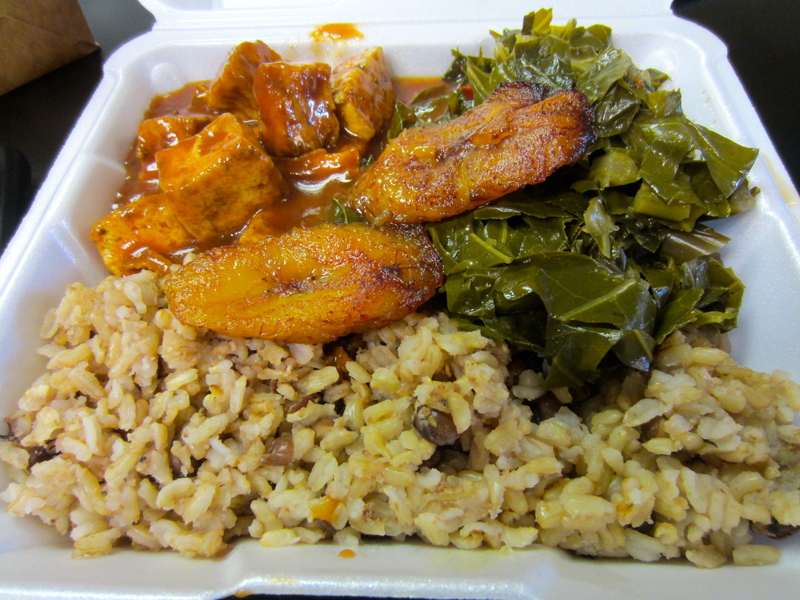 Lacking originality, I got rice & peas, collards and BBQ tofu. With a couple of bonus slices of plantain on top. 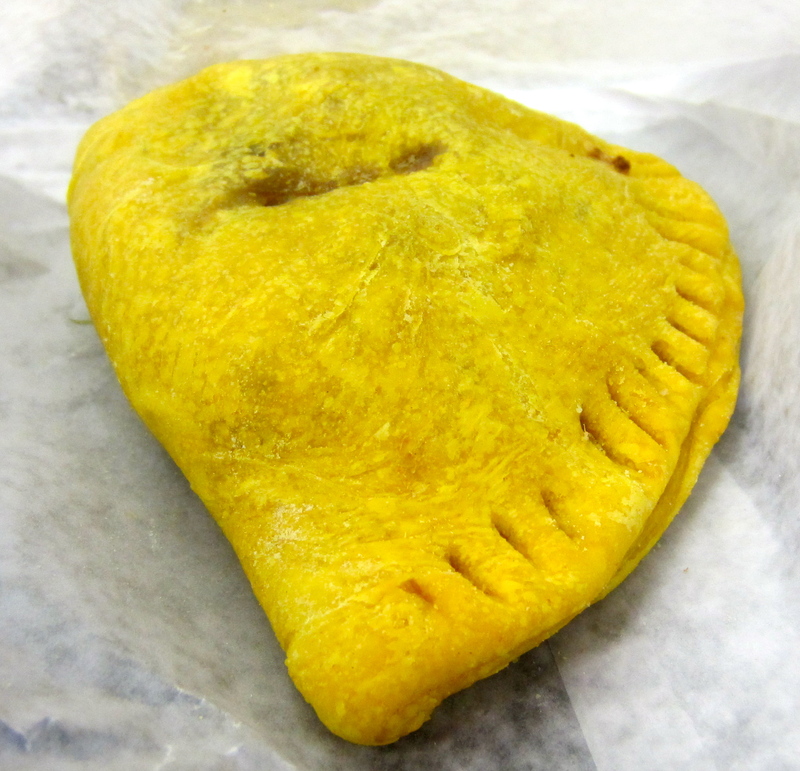 This time, they had patties, callaloo patties! Is it wrong that I like mine better? I make the callaloo a little spicy. These are still good though and didn’t require any work on my part. Yay, another raw night! My new favorite thing might be fresh coconut meat. My least favorite thing might be getting into said coconut for meat. It was a bear. Seems like boy work. I might make Kevin do it next time. 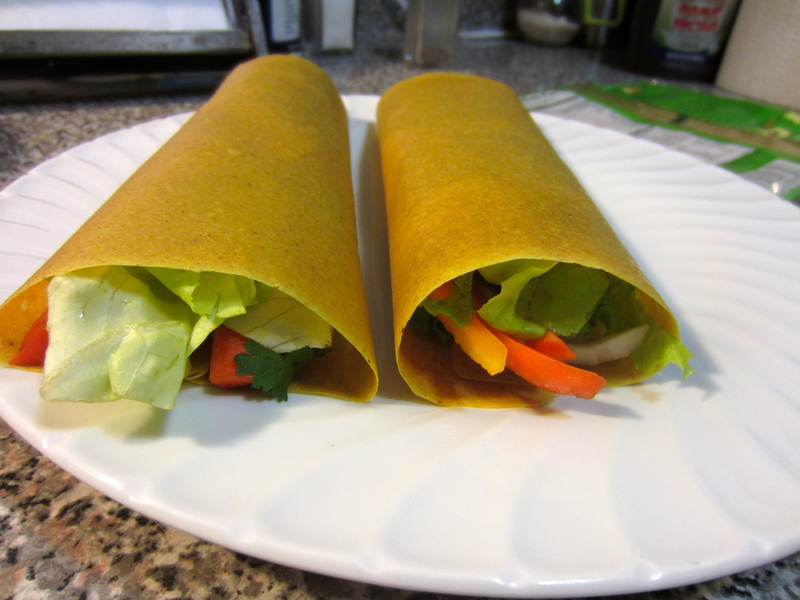 The Mango Wraps are from Everyday Raw. And actually I didn’t make the wrappers since I don’t have a dehydrator. Sevananda has started carrying some raw coconut based wraps so I used those instead. The sauce for these was so good. I think the leftover sauce ended up being salad dressing. 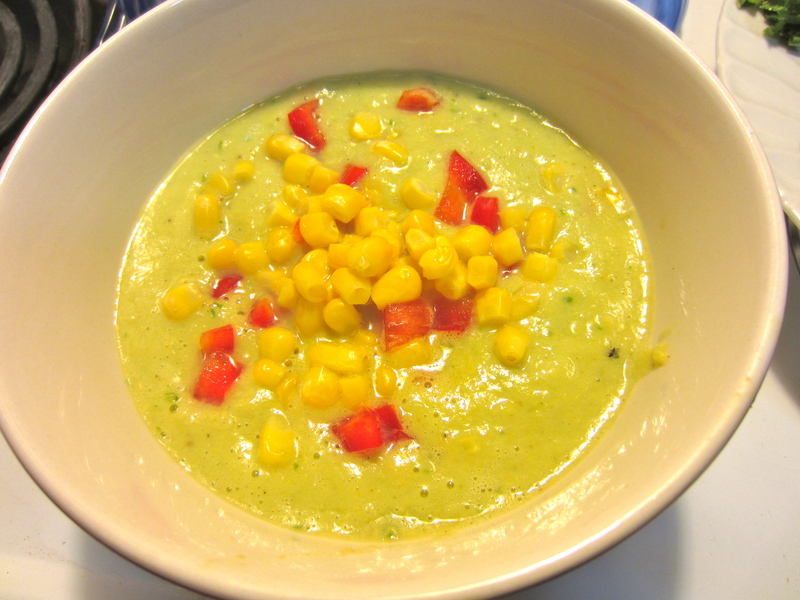 And the soup was Aiyah’s Garden Living Corn Chowder from Vegan World Fusion Cuisine. I cheated and used frozen corn. Although last weekend they had corn at Your Dekalb Farmer’s Market. But that’s just wrong this time of year. Yes, this recipe is extraordinary with fresh summer corn, but it’s also really, really good with decent frozen corn. 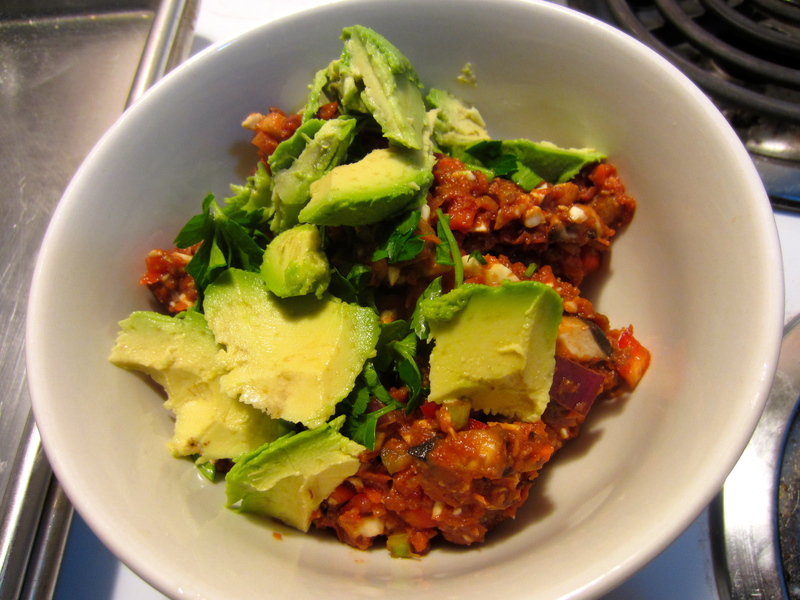 This is the chili from Everyday Raw. I can be weird about mushrooms, but the amount of portobello in here is small enough that it didn’t bother me. The texture was a nice mix of crunch and soft and the taste was spot on chili. The recipe made a huge amount. I will try halving it next time I make it. 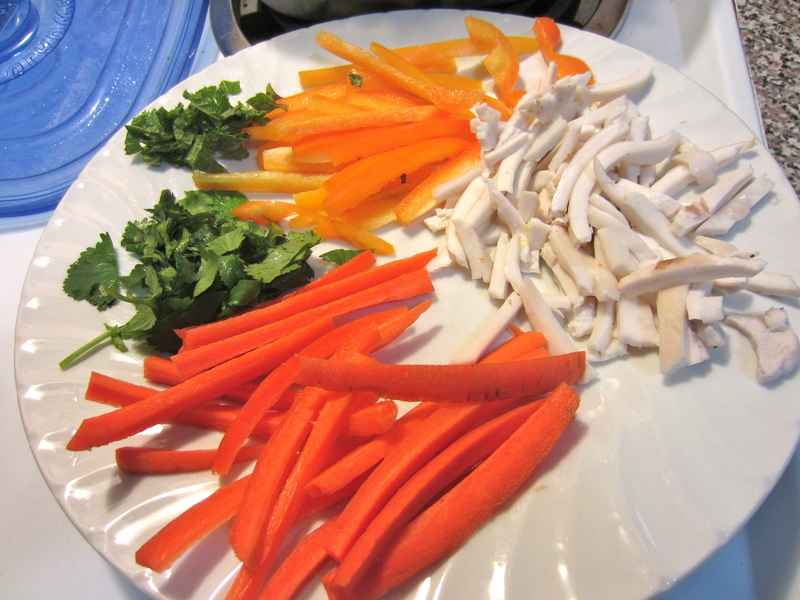 I can only eat so much of strongly acidic foods like this.